What did the Seventh Doctor do before he collected the Master's exterminated remains from Skaro at the beginning of the TV movie? The answer to that depends on which books you have read. Two BBC Books titles (Gary Russell's novelisation of the film and Terrance Dicks's The Eight Doctors, the flagship of the BBC's range of original Who novels) state that the Seventh Doctor travelled alone for some time, growing rather bored, before receiving a telepathic message from the apparently doomed Master. However, in Marc Platt's Lungbarrow (the last of Virgin Publishing's New Adventures to feature the Seventh Doctor, published after the BBC's movie novelisation but before The Eight Doctors, and shortly before Virgin's license to publish Who fiction expired) the Doctor is assigned to collect the Master's remains by Gallifrey's president. It is a mission for which he departs immediately, leaving his companion Chris Cwej behind on Gallifrey. Of course, if you don't read any of the books, then the Seventh Doctor's penultimate adventure would either be Survival or one of the Big Finish audio releases, but I will assume from this point that you are interested in the books! Some would argue that while the BBC's novels may count, Virgin's certainly don't, because they are all long since out of print. However, if we applied that principle to the original TV show, then we would have to disregard the likes of Marco Polo and The Power of the Daleks, stories that no longer exist visually. The New and Missing Adventures continue to exist on the shelves of those who collected them. Author Lawrence Miles has a theory that the Virgin stories don't take place in the same universe as the BBC novels. His Doctor-less New Adventure, Dead Romance, and his two-volume Doctor Who novel for the BBC, Interference, both imply that the Virgin universe exists on another dimensional plane inside a miraculous bottle. Now where's the fun in that? I regard the various editors and publishers of the Doctor Who books as I do the different producers of the TV show and the different Doctors' tenures. Despite obvious differences in the tone of each era, I doubt that many fans would regard the stories produced by Philip Hinchcliffe as being set in a different universe to those produced by Graham Williams. Neither would they consider the Pertwee era to have taken place on a different dimensional plane to that of the Troughton years. In any case, the final Doctor-less New Adventure, Twilight of the Gods, undermines Miles's proposition - but that's a debate for another time. Many authors currently writing for BBC Books - such as Paul Cornell, Terrance Dicks, Steve Lyons, David A. McIntee, Justin Richards and, perhaps most of all, Gary Russell - continue to refer back to Virgin continuity, particularly in the case of Virgin books that they themselves wrote. It would seem, therefore, that those old stories aren't going to go away. 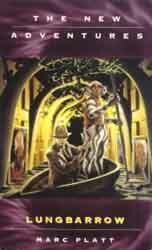 Assuming that you do care about the books and would like them all to take place in the same universe, why does the Seventh Doctor depart immediately for his assignment at the end of Lungbarrow, then apparently forget all about it, and instead wander through space and time, getting lonely, before finally receiving that telepathic plea from the Master? A possible answer lies in the sketchy nature of Lungbarrow's closing pages, during which Marc Platt never actually documents the briefing for the mission. The author has the Doctor's former companion Romana, now president of Gallifrey, and Ferain, a member of the nefarious Celestial Intervention Agency, beginning to describe a mission to Skaro, but then the scene changes. When we return to the conversation, the Doctor has already made up his mind that: "If it's the Master's remains, then I should be the one to fetch them." Ferain points out that the Matrix, Gallifrey's awesome computer net, "predicts a 96 per cent chance of fatal injury", so it is possible to infer that the Master's extermination hasn't actually happened yet but has been predicted by the Matrix. 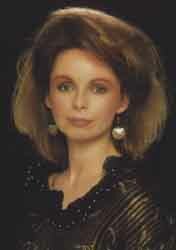 Perhaps Romana wishes to assign the Doctor in advance of the event. Flavia became president of the Time Lords on TV in 1983's The Five Doctors and also featured in Terrance Dicks's New Adventure, Blood Harvest (The Eight Doctors goes to complicated lengths to explain why Flavia was not in charge during 1986's The Trial of a Time Lord). Blood Harvest also features Castellan Spandrell, a popular character who is said to have been in and out of retirement since the events of the 1976 TV story The Deadly Assassin, and the return of Romana from the universe of E-space. Several New Adventures later, Paul Cornell's Happy Endings reveals that Romana has succeeded Flavia as president. She appears again in Lungbarrow, by which point Spandrell has been succeeded by Andred, a character who appeared on TV in The Invasion of Time. But then Flavia and Spandrell reappear as president and castellan respectively in The Eight Doctors, which reflects the administration seen in Blood Harvest. How can this be? An explanation that may seem, on the surface, to be obvious would be that Doctor Who is a time-travel series, so the Gallifreyan scenes in The Eight Doctors are simply set at a point in time before Romana succeeds Flavia. After all, later BBC novels - Paul Cornell's The Shadows of Avalon and Peter Anghelides and Stephen Cole's The Ancestor Cell - have also featured President Romana. However, one of the points that is reiterated by The Eight Doctors is that Time Lords are not ordinarily allowed or able to encounter each other, or their other incarnations, out of sequence. This is backed up by the fact that the Doctor's meetings with the Master and his landings on Gallifrey have, with a few notable exceptions, been in chronological order. Admittedly, this is largely a factor of TV script writers either not wishing to confuse their audience or just not considering the possibility of an out-of-sequence meeting between Time Lords. 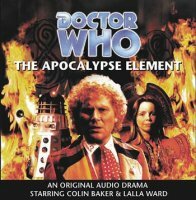 Additional evidence can be found in President Romana's dialogue in Big Finish's The Apocalypse Element, when she reveals her surprise at meeting the Sixth Doctor after she has already encountered the Seventh. Furthermore, it is fairly clear in The Eight Doctors that President Flavia considers the Eighth Doctor to be the current one. A possible way around this problem would be to assume that Gallifrey's recent history has been altered. The Eight Doctors sees the legendary Gallifreyan Rassilon making small "improvements" to his planet's history by sending the Doctor back into its past, something that is not normally possible. Flavia's first appearance in the novel comes after the Doctor has begun his quest, so perhaps a new timeline has been established in which Flavia and Spandrell have not yet been succeeded. Or perhaps the Seventh Doctor, who, without the aid of Rassilon, has bent the Laws of Time by meeting his former selves on numerous occasions, somehow managed to meet Romana out of sequence in Happy Endings and Lungbarrow. This is the theory put forward in my short story Distractions, which attempts to bridge the discontinuities between the Virgin and BBC novels by explaining away both the Romana/Flavia problem and the aforementioned issue of the Doctor's mission to Skaro. Distractions also touches upon the contentious subject of the Doctor's redesign of the TARDIS interior to create the version that we see in the TV movie. Both the novelisation of the film and The Eight Doctors assert that the Seventh Doctor reconfigured the design in his spare time. However, Lungbarrow implies that the interior is altered as a result of the ship being closed down and restarted - the Doctor's companion Chris reacts by exclaiming, "You won't believe what the inside of the TARDIS looks like!" Rather helpfully, author Marc Platt doesn't actually describe the new interior in Lungbarrow. 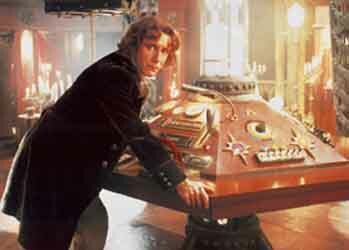 It is therefore possible that the design seen by Chris is later modified by the Doctor prior to events in the TV movie. Furthermore The Eight Doctors states that the console room seen in the TV movie is actually a version of the so-called secondary control room, the mahogany-panelled room seen on TV during Season Fourteen. "Secondary" is a bit of a misnomer, however, because this room, according to the Fourth Doctor in The Masque of Mandragora, is in fact older than the more familiar white-walled control room. It would thus make sense that, when "rebooted" in Lungbarrow, the TARDIS would return to its original configuration, with the wood-panelled room reinstated as its primary control chamber. Another aspect of The Eight Doctors that seems to conflict with Virgin continuity is the incorporation, in the Seventh Doctor's chapter, of a couple of scenes featuring the Master. In the first of these scenes, the Doctor's arch enemy, having just escaped from the Cheetah planet featured in Survival, goes in search of the worm-like creature that he will use to cheat death in the TV movie. However, The New Adventures had already featured a post-Survival Master, who had even managed to regenerate in David A. McIntee's First Frontier. The fact of the matter is that when Terrance Dicks wrote The Eight Doctors, he had to be careful not to alienate readers who may not be familiar with Virgin's output. Consequently, his description of the Seventh Doctor's costume matches the one worn during Season Twenty-six rather than any of the Doctor's less eccentric New Adventures outfits. However, there is a deliberate element of vagueness that makes it possible to incorporate Virgin mythology. Notably, Dicks makes no mention of the Doctor's companion Ace, who goes by the name of Dorothée in the later New Adventures. By simply establishing the fact that the Seventh Doctor has been travelling alone, the author allows new readers and New Adventures fans alike (and, for that matter, readers of the Doctor Who Magazine comic strip Ground Zero, in which Ace is killed) to imagine their preferred version of her departure. 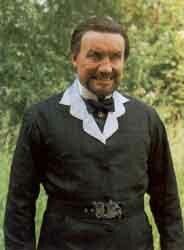 Dicks is similarly circumspect in his depiction of the Master, realising that some readers will have Anthony Ainley's incarnation in mind, while others might expect the "McIntee" Master. In light of the recent Big Finish release, one could just as easily imagine the once again emaciated Master from Dust Breeding, as played by Geoffrey Beevers. His condition would provide ample motivation for his audacious scheme to steal the Doctor's body in the TV movie. I prefer to assume that the Doctor meets the Master out of sequence in Dust Breeding, and that this Master used to be the "McIntee" incarnation before he was ravaged by the Warp Core. The first of the Master's two scenes in The Eight Doctors may be regarded - after the first line, which ties his narrative in with the Seventh Doctor's - as a flashback to a point in time just after events in Survival. The second scene, in which the Master arrives on Skaro, having made genetic modifications to the "deathworm", could easily concern the "McIntee" or Beevers Master. One needs to assume that there is an interim between the Master's two scenes anyway, even if one only accepts BBC Books as canon. This is because other BBC stories set between Survival and the TV movie have featured the Ainley Master - the short story Stop the Pigeon by Robert Perry and Mike Tucker, and Tucker's solo novel Prime Time. A couple of other aspects of The Eight Doctors may appear to contradict the Virgin novels (the sheer number of continuity headaches caused by this one book are mainly due to the fact that it deals with the entire duration of the TV show's mythology). The following issues are not dealt with in Distractions, but I do have answers for them, as you will see. The first of these concerns the revival of Borusa. The Eight Doctors recycles a number of elements from Dicks's own New Adventure, Blood Harvest. These include the vampires from his 1980 TV serial State of Decay, Gallifreyan conspiracies, the Timescoop from The Five Doctors and the release of President Borusa from the "living death" that was imposed upon him by Rassilon in that same story. In both Blood Harvest and The Eight Doctors Borusa is revived, is shown to have learnt the error of his ways, then chooses to rejoin a merciful Rassilon in peaceful slumber. How can this process happen twice over? In chronological order, Borusa is initially released in The Eight Doctors to help restore public order following insurrection sparked by the corrupt High Council's devastation of Earth during The Trial of a Time Lord. 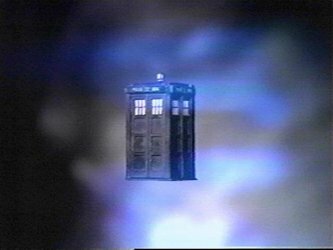 Under his supervision, time is folded back and Earth is restored, after which Borusa departs "to share Rassilon's long repose". 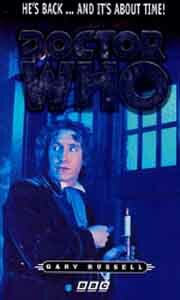 As a result of the temporal manipulation, the memories of all witnesses to these events become blurred, and the participation of the Eighth Doctor and Borusa become akin to legend. Next, in Blood Harvest, the Committee of Three, a group of Borusa's former followers, seek to return him to power, blaming the Doctor for his imprisonment. Perhaps the Three are unaware that it was the Doctor himself who released Borusa on that earlier occasion, or perhaps they do not believe that Borusa resumed his sleep willingly. With the aid of an elemental entity called Agonal, they release Borusa from his resting place within the Tomb of Rassilon. It is curious that the face of Borusa is still visible on the bier in the tomb (it became blank in The Eight Doctors), but then this would be what the conspirators expected to find. Maybe this is another manifestation of Rassilon's cunning - he could have foreseen that Borusa would be needed again. To the surprise of the Committee of Three, Borusa announces that he has no wish to be released. 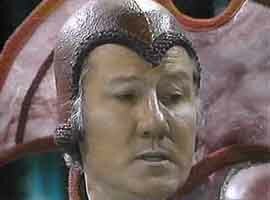 Defeated by Rassilon, Agonal takes Borusa's former position on the bier, and Rassilon declares that he has "a better place" for the former president, who then vanishes for the last time. Revisiting the tomb in the final chapter of The Eight Doctors, the Doctor notices that Borusa's place on the bier is now blank. No mention is made of Agonal, but this is forgivable, as to do so would have further complicated the story. Perhaps Rassilon had forgiven another transgressor in the interim, and Agonal's position had been shuffled around, or perhaps Rassilon always keeps one space free for future eventualities - which would certainly reduce the coincidental nature of that single empty space seen in The Five Doctors! The fate of the Timescoop device follows a similarly convoluted but workable sequence of events. Following its illegal use in The Five Doctors, President Flavia orders the Timescoop to be destroyed (as she recalls in The Eight Doctors). However, it would seem that she delegates this task to the CIA, who regard the device as "too useful ... to waste" (The Eight Doctors). Perhaps the CIA convince Flavia that mere deactivation will suffice, for in Blood Harvest she states, "I ordered that device to be deactivated." The Committee of Three reactivate the Timescoop, but it is severely damaged in Paul Cornell's Missing Adventure, Goth Opera. Evidently the CIA manage to salvage it some time prior to The Eight Doctors, when it is then used by Ryoth, a character who is said to have had marginal involvement with the Committee of Three (an unequivocal reference back to Virgin mythology). Ultimately, both Timescoop and Ryoth are eaten by a Drashig! While writing Distractions, I also threw in a couple of references to meetings that had occurred between the Fifth, Sixth and Seventh Doctors prior to the Big Finish audio release The Sirens of Time. Naturally enough, to avoid confusing the hell out of casual listeners, Sirens does not refer to Lance Parkin's Fifth and Seventh Doctor novel Cold Fusion or to the Sixth and Seventh Doctors' joint venture in the Doctor Who Magazine strip Emperor of the Daleks. I have assumed that the Doctors were simply too busy to discuss their previous encounters. I'm not suggesting that no further inconsistencies exist within the book series, but then no one could ever claim that the original TV series was consistent either. The novels of Robert Perry and Mike Tucker, for instance, have stated that Ace's surname is Gale, which conflicts with the more commonly used McShane. Steve Lyons's Head Games and Gary Russell's Business Unusual give different years for Melanie Bush's departure from Earth. The status of Sarah Jane Smith implied by Bullet Time is at odds with both Justin Richards's Millennium Shock and some of Lawrence Miles's predictions for her future in Interference. Different authors disagree as to whether the First Doctor had one heart or two (my money's on one - see The Edge of Destruction). Then there's the old bugbear of dating the UNIT stories. In such cases, I just do a bit of mental editing as I read, substituting the name, number or date that I prefer. Terrance Dicks's books (for both ranges) have had Gallifreyans referring to their brothers, whereas numerous New Adventures have insisted that all Gallifreyans are reproduced by means of genetic Looms, and only have cousins. I tend to assume that "brother" to a Gallifreyan simply means "male cousin". And perhaps the "father" to whom the Doctor refers in the TV movie was in fact Quences, the elder of the Doctor's House of Lungbarrow. Just as dedicated fans, including the novelists, have sought to explain the TV show's many inconsistencies, so we should be able to handle those that arise within the books. If you're enough of a fanboy (or girl) to notice or care a jot about such inconsistencies, then you can also be enough of a fanboy to iron them out with a little imagination. If all else fails, troublesome stories can always be consigned to Lawrence Miles's bottle universe! The quest for consistency and continuity will continue for as long as new fictions are produced.